Strengths: Bobrovsky is a naturally athletic butterfly-style goaltender and is quickly becoming one of the NHL’s most competitive and elite netminders. He is a hard worker whose confidence can inspire his team to go on long winning streaks. Weaknesses: Bobrovsky is still establishing himself as a long-term no. 1 goalie and has yet to find success in the playoffs. He has no playoff wins in six starts. Biography: Sergei Bobrovsky was born in and began playing hockey in the Siberian city of Novokuznetsk. He developed as a goaltender with the Metallurg club. In 2006, he made his professional debut playing for Metallurg in the Russian Superleague. From the next season onwards, he was the team’s starting goalie. Bobrovsky played well and was even invited to the league’s all-star game in 2008, but his team was a perennial playoff outsider. At the 2008 World Junior Championship, Bobrovsky was Russia’s main goaltender and the team finished with bronze medals. Sergei’s big break came in 2010, when his contract with Metallurg Novokuznetsk expired. He was never drafted in the NHL, so he was signed a contract with the Philadelphia Flyers as a free agent. Despite making the Stanley Cup final in the previous season, the Flyers’ goaltending was a major question mark during the 2010 training camp. An injury to the team’s main goalie gave Bobrovsky the chance to show he could be the no. 1. One month into the season, Bobrovsky was leading all NHL goalies in wins (11 in 14 games) and was named the rookie of the month. By the end of the season, he accumulated 28 wins in 54 games. Despite his regular season success, Bobrovsky faltered in his first playoff game and was relegated to backup. For the next season, the Flyers signed fellow Russian Ilya Bryzgalov to share goalkeeping duties with Bobrovsky. Sergei was the backup for most of the season and his statistics were not as good as in the previous season. In the summer of 2012, he was traded to the Columbus Blue Jackets. During the 2012-13 NHL lockout, Bobrovsky played for SKA St. Petersburg of the KHL. He had an excellent rebound season and rgained confidence, posting 18 wins in 24 games for SKA before the NHL resumed. Bobrovsky continued his brilliant play for Columbus. He was the team’s MVP in the short season and almost led the Blue Jackets to the playoffs. Although the team did not make the post-season, Sergei was nominated for the Vezina Trophy as the NHL’s best goalie. Strengths: Nikulin has developed into one of Russia’s most skilled and trusted defensemen in both club and international play. He has an imposing presence on the blue line and is an effective powerplay coordinator. Nikulin is a leader on Ak Bars and on the Russian national team. Weaknesses: As he logs lots of ice time, Nikulin can be prone to making defensive mistakes due to fatigue. Although he is a respected player in Russia, Nikulin has not tried out the NHL and his playing experience on the small-ice remains limited. Biography: Born and raised in Russia’s capital, Nikulin developed in the Dynamo Moscow hockey school which was known for producing some of Russia’s best defensemen. Ilya played primarily as a stay-at-home blueliner for Dynamo’s farm club in his first few years. 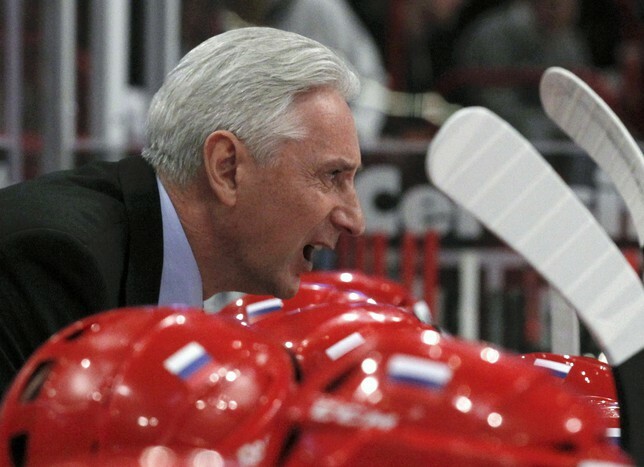 He represented Russia at two Under-18 World Championships and was on the silver medal team in 2000. In the same year, he caught the attention of NHL clubs and was the first player drafted in the second round of the NHL entry draft. Nikulin was selected by the Atlanta Thrashers. However, he never joined the club, instead preferring to stay in Russia and blossom into one of Dynamo’s most reliable players. In 2005, Dynamo became the Russian Superleague’s playoff champions. Ilya continued his career with Ak Bars Kazan – one of the perennially most consistent and dangerous teams in Russian hockey. Kazan won the league championship in Nikulin’s first year there. With each subsequent season with Ak Bars, Nikulin’s icetime increased and he became the team’s go-to defenseman in all situations, including on the powerplay and penalty-killing. In 2008, Nikulin came close to leaving to the NHL to play for the Thrashers, but decided to remain with Ak Bars in the newly-formed KHL. His team won the KHL’s Gagarin Cup in the league’s first playoffs in 2009, and again in 2010. In recent years, Nikulin also became one of the KHL’s top-scoring defenders. His slapshot has infuriated numerous playoff opponents. 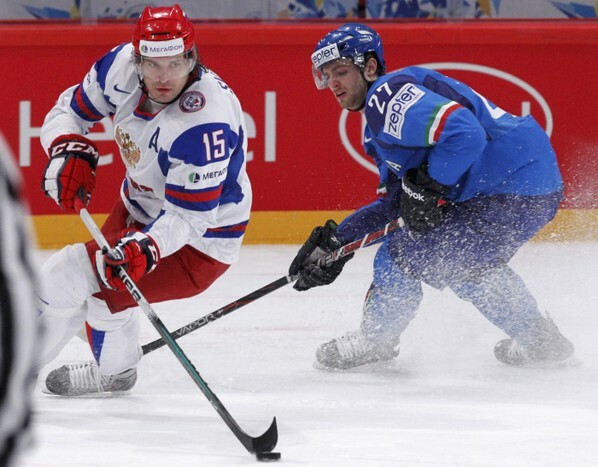 Each year since 2006, Ilya has played for Russia at the World Championships. He was on the gold-winning teams of 2008, 2009, and 2012. Nikulin captained the 2012 and 2013 teams. He also played in the 2010 Olympics. Strengths: Viktor Kozlov is a tall, versatile forward who can easily play in all three forward positions and log many minutes of ice time. Kozlov has great reach and is very skilled with the puck. He is a natural leader on and off the ice. Weaknesses: In the NHL, Kozlov was a very streaky player. For his high skill level, he has not dominated as could be expected. Also, Kozlov does not always use his size well in physical battles. Biography: Viktor Kozlov comes from Russia’s automotive capital, Togliatti, where hockey is the number one passion. So it was no surprise that the tall and lanky son of a crane operator made his way through the local hockey school and debuted for Togliatti’s team in the Soviet league, Lada, at the age of 16. At age 17, he moved to the capital to train with Moscow Dynamo. In Kozlov’s first full season with Dynamo in 1993, his team won the Russian championship. Kozlov played another year and a half in Moscow under coach Petr Vorobiev before making the move across the ocean to play for the NHL team that drafted him, the San Jose Sharks. A few days before leaving to San Jose, Kozlov broke his leg in a Dynamo game and took several months to heal before making his NHL debut. Being in a new country and not knowing English, Viktor lived with Sharks goalie Arturs Irbe. Kozlov reportedly finished the 1995 season with the Sharks’ farm club because of a joke he made that the Sharks’ humourless coach did not appreciate. Kozlov did not live up to full expectations playing for the Sharks, but became a real star and productive forward after being traded to the Florida Panthers in 1998. In Florida, Kozlov centered Pavel Bure. In two of their seasons playing together, Bure led the NHL in goal scoring. The two were also invited to play in the NHL All-Star Game in 2000. 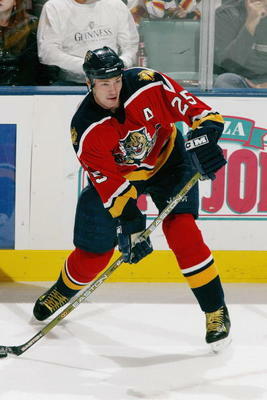 Kozlov remained a leader for the Panthers until being traded to New Jersey in 2004. That year, the NHL locked out its players, so Kozlov spent a year back in Russia playing for his hometown Lada. Back in the NHL, Viktor had three productive years from 2006 to 2009, first setting a career-high in goals playing for the New York Islanders, and then next season setting a career high in plus/minus playing for the Washington Capitals with fellow Russian stars Alex Ovechkin, Alex Semin, and Sergei Fedorov. 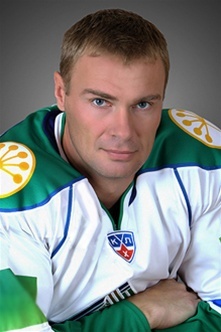 In 2009, Kozlov signed a three-year contract with Salavat Yulaev Ufa in Russia’s KHL. Kozlov remained productive, mostly centering Alexander Radulov. In 2011, the team won the KHL’s Gagarin Cup as playoff champions. 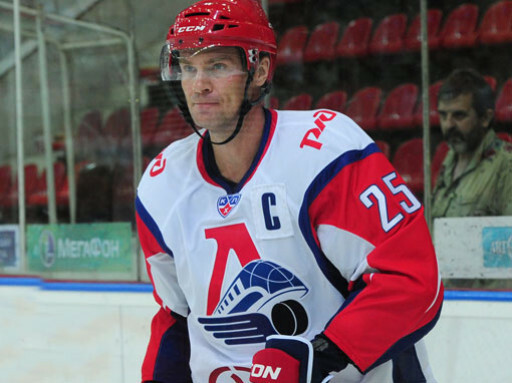 In 2012, Kozlov joined the new Lokomotiv Yaroslavl team and was later traded to CSKA Moscow. Kozlov has represented Russia in many world championships and in the 2006 and 2010 Olympics. He has a silver and a bronze medal from the European Junior Championship in the early 1990s and was part of the bronze medal-winning team in 2005 and the silver medal-winning team in 2010 at the World Championship. 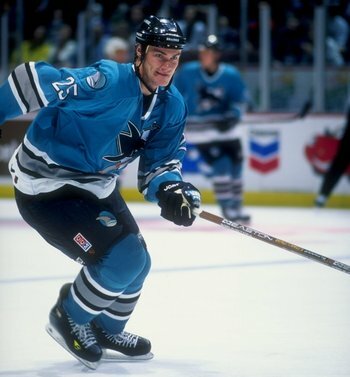 Kozlov began his NHL career with the San Jose Sharks in 1995. Kozlov set career highs in assists and points while centering Pavel Bure in Florida. Kozlov is one of the most effective players in the shootout. He scored his most goals as a member of the New York Islanders in 2006-07. The Washington Capitals’ Russian quartet of Semin, Kozlov, Fedorov, and Ovechkin in 2008. Kozlov fighting for the puck at the 2010 Olympics in Vancouver. Kozlov attacking the Germans at the 2010 World Championship. Kozlov captained Salavat Yulaev to winning the KHL’s Gagarin Cup. Here he holds the trophy with Alexander Radulov.